Apt 2, The Toffee Works, Crescent Road, Harrogate - �230,000 with Nicholls Tyreman, 01423 503076. The twin villages of High Harrogate and Low Harrogate long ago coalesced into a single town, but the two areas still have distinctive character traits. While High Harrogate, near Christ Church, is dominated by the Stray and retains some of its original structures (such as the town’s first theatre, on Park Parade), Low Harrogate was, and still is, the cultural heart of the town. 11 Royal Parade, Harrogate - �379,950 with Andrew Hill, 01423 528528. Although the area’s first mineral spring was discovered at Tewit Well, the sulphur spring found further down the hill helped ensure that Low Harrogate became the historic hub of the local spa industry. As such, it is home to the Royal Baths, the Royal Pump Room Museum, and the Valley Gardens, where a greater number of unique mineral springs come to the surface than at any other place on Earth. Here too is the Mercer Art Gallery, as well as many of the town’s oldest and best known hotels, such as the Crown, the Old Swan, and the White Hart. As a result, it has also attracted a wealth of independent shops, bars and restaurants, to add to the older ones, such as Hale’s Bar, which, with its gas cigar-lighters, is said to be Harrogate oldest. All this in turn of course makes Low Harrogate homes hot property, but while it may not be cheap to buy, it’s highly unlikely to depreciate in value. The following three flats are all typical of the selection available, being both unique and charming. Apartment 2, The Toffee Works (pictured, above) is a first-floor flat in the converted former premises of Farrah’s Harrogate Toffee, as old sepia photographs show. It has a large entrance hall, two bedrooms, two bathrooms, and a living room (with bay window looking out onto Crescent Road) which is open-plan to the breakfast kitchen. The tenure of the property is leasehold for a term of 120 years with a ground rent of £200 per annum and a service charge of £2,602.78 per annum. Just up a cobbled street from here is 9 Imperial Mansions (pictured, right) which perches on the top (fourth) floor of an elegant period building on Royal Parade. The largest of the flats featured here, it has two bedrooms, two bathrooms, study area, and a large open-plan living space incorporating kitchen, dining, sitting and living areas. It also has fantastic views over the Pump Rooms, the Valley Gardens and the Montpellier Quarter. There’s a ground rent of £200 per annum, plus an annual maintenance fee of £1,500, which includes buildings insurance. Continuing to circle anti-clockwise around the Crown Hotel, the Royal Baths II development (pictured, left), behind the Royal Baths proper, overlooks the Crown roundabout. Apartment 2 is a ground-floor flat with a patio area to the rear. It has two bedrooms, bathroom, kitchen and good-sized living room, and two kinds of double glazing provide excellent sound and heat insulation. There is an allocated underground parking space, accessed via a secure entry system. 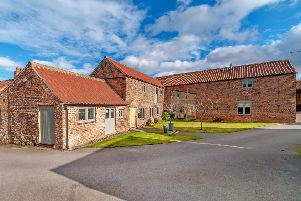 The tenure of the property is leasehold for a term of 999 years from 2001, a ground rent of £500 per annum and a service charge of £1,768 per annum.